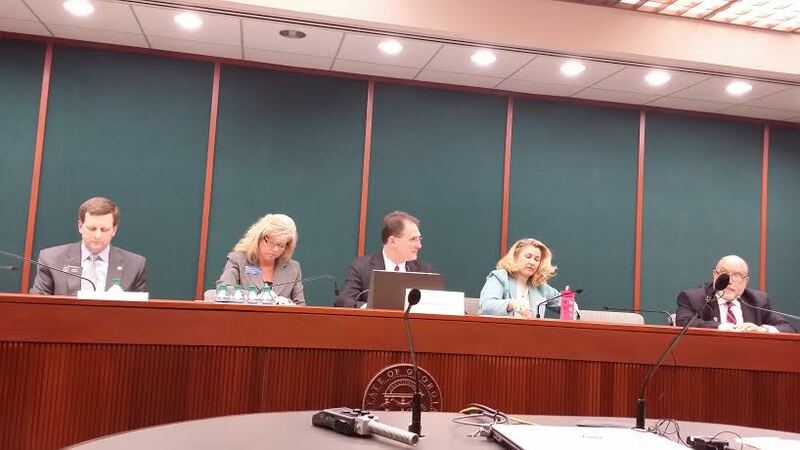 (APN) ATLANTA — Following concerns raised by activists, State Rep. Kevin Tanner (R-Dawsonville) has backed off his no knock warrant “reform” legislation, HB 56. However, State Sen. Vincent Fort (D-Atlanta) is pushing forward with his legislation, SB 45; and Sen. Jesse Stone (R-Waynesboro) has introduced his own version. Those who have opposed no knock warrant “reform” legislation have included James Bell, Catherine Bernard, Garland Favorito, Sharon Ravert, Bill Simon, Dean Sines, and Nydia Tisdale. On yesterday, Monday, March 02, 2015, the Judiciary Non-Civil Committee convened to hear public comments on SB 45 and SB 159. So many people signed up to speak, until after an hour the committee meeting was adjourned and rescheduled to continue on Wednesday, March 04, to allow everyone to speak. SB 45, authored by Sen. Fort, is called Bou Bou’s Law. SB 159, sponsored by Sen. Jesse Stone (R-Waynesboro), is similar to HB 56 sponsored by Rep. Tanner, but does not have the reporting element. These bills were created with the stated intent to limit, control, and restrict no-knock search warrants, which have killed and injured innocent Georgia citizens. The bills have bipartisan support and were expected to easily move through the process to become law. However, a controversy has developed, led by attorney Catherine Bernard, who raised the issue during a subcommittee meeting on HB 56, that Georgia Code O.C.G.A. 17-5-27 always requires officers to give verbal notice before force can be used in executing a search warrant. Thus, no-knock search warrants are currently not codified in the Georgia Code. Bernard cites they are being used because of judicial activism by the courts. Thus, two sides have developed on this issue. On the one hand, we have lawyers and even some law enforcement officers who want to pass laws clarifying that no-knock search warrants are illegal in Georgia altogether. On the other hand, we have other lawyers and law enforcement officers who want to make them legal in the Georgia code, but create a higher bar for issuing no-knock search warrants with restrictions. “No-knock warrants are used in Georgia and it’s based on case law. The chance of doing away with them altogether is very slim. So the question for me is, do we pass legislation which would restrict them? I think that is the way to go,” Sen. Fort told Atlanta Progressive News. “We are dealing with a situation where we have to say the courts have gotten it wrong… we all missed this… but the legislators can make it right now,” Bernard told the Committee. She suggested legislation that officers cannot execute any warrants that are in violation of Georgia law, to strengthen the verbal notice requirement in OCGA 17-5-27. “The family of Baby Bou Bou would like to see some legislation that does codify and control no-knock warrants,” Mawuli Davis, attorney for the Phonesavanh family, told the committee. Davis goes on to stress the need for more restrictions, regulations, and a way of reporting and tracking how many no-knock search warrants are issued, who is applying for them and for what purpose. “Case law allows no-knock warrants, but the standards and provisions are not there to prevent the tragedies we have seen across the state,” Davis said. A retired police officer, Tom McCain, testified that regular search warrants, at unreasonable times, are dangerous; and it is safer for the officer to announce himself and tell his purpose. “The most dangerous warrant I ever served was a no-knock warrant,” McCain said. The Georgia Association of Criminal Defense Lawyers and the American Civil Liberties Union of Georgia (ACLU) both said they support SB 45 and SB 159, and that they worked on HB 56. “Federal and State case law authorizes these warrants. We recognize that neither judicial, legislative or executive override of that is forthcoming at this time. We seek to work within the confines of what is possible to reduce harm on the ground,” Marvin Lim with ACLU told the committee. Stay tuned for more fireworks on this issue.